Josey is a more mild mannered fellow. He has a beautiful full head and correct breed type. His movement is flawless. 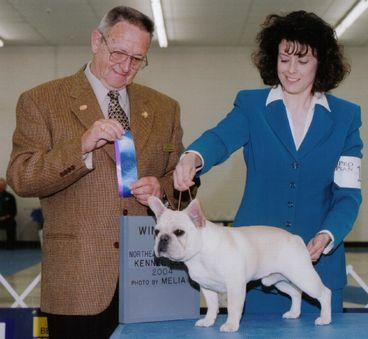 He had three major wins all from the 6-9 month puppy class and finished by 13 months old. Josey takes 3rd in a large 12-18 Month class at the Dallas/Ft Worth French Bulldog Regional specialty show preceeding the National!